For the Buddhist deity, see Citipati (Buddhism). The type species, Citipati osmolskae, was described by James M. Clark, Mark Norell, and Rinchen Barsbold in 2001. A second, as yet unnamed species may also exist. 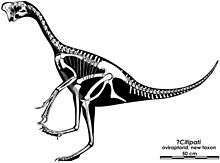 Citipati is often confused with the similar Oviraptor. The name Citipati is formed from the Sanskrit words citi, meaning 'funeral pyre' and pati meaning 'lord' (चितिपति). In Tibetan Buddhist folklore, the Citipati were two monks who were beheaded by a thief, while deep in a meditative trance. The Citipati are often depicted as a pair of dancing skeletons surrounded by flame, hence the application of the name to the beautifully preserved oviraptorid skeletons. The type species of Citipati, C. osmolskae, was named by Clark et al., in honor of Halszka Osmólska, a noted paleontologist whose work has dealt extensively with oviraptorids and other Mongolian theropods. 1 2 3 Clark, J.M., Norell, M.A., & Barsbold, R. (2001). "Two new oviraptorids (Theropoda:Oviraptorosauria), upper Cretaceous Djadokhta Formation, Ukhaa Tolgod, Mongolia." 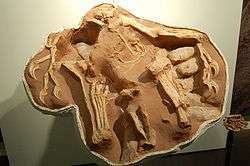 Journal of Vertebrate Paleontology 21(2):209-213., June 2001. ↑ Norell, M.A., Clark, J.M., Chiappe, L.M., and Dashzeveg, D. (1995). "A nesting dinosaur." Nature 378:774-776. 1 2 3 4 Clark, J.M., Norell, M.A., & Chiappe, L.M. (1999). "An oviraptorid skeleton from the Late Cretaceous of Ukhaa Tolgod, Mongolia, preserved in an avianlike brooding position over an oviraptorid nest." American Museum Novitates, 3265: 36 pp., 15 figs. ; (American Museum of Natural History) New York. (5.4.1999). 1 2 3 Norell, M. A., J. M. Clark, D. Dashzeveg, T. Barsbold, L. M. Chiappe, A. R. Davidson, M. C. McKenna, and M. J. Novacek (1994). "A theropod dinosaur embryo, and the affinities of the Flaming Cliffs Dinosaur eggs." Science 266: 779–782.